Okay, okay. You want me to give a full and proper review of this movie, don’t you? But this.. this is one of the most incredible movies I’ve ever seen. I’ll admit, when I saw the trailer, I thought it looked like a ‘Life Of Pi’ wannabe. And a 6 year old as a contender? Do you really think that THE ACADEMY that snubbed ‘Dark Knight’ for Best Picture, would consider giving an Oscar to a little girl that would shove it in her closet next to a ballet trophy and a picture of Grandma? But, woah was I wrong. This is a prime example of ‘good story, well told’ that all movies need to be in order to be Oscar Contenders. 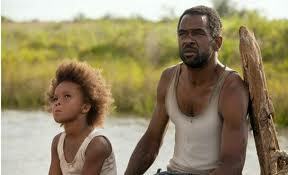 The story is about a 6-year old girl named Hushpuppy (Quvenzhane Wallis), who lives with her father Wink (Dwight Henry). Neither of them have ever acted in a movie before, which you’ll find very surprising when watching this film. They live on an island called the Bathtub which floods (maybe you should’ve named it something else), and they have to adapt with the possibility of civilization discovering their town. The second the movie begins you will be sucked into the world it creates. It feels like a documentary at times, portraying the real world in a way that makes you feel like you’re there. You can sense the small budget, but that works to its advantage. There’s no tricks, no sets, no digital enhancements. It’s just the life of this girl over a month. Speaking of which, people better learn how to pronounce that name if they’re gonna call it out on Oscar Night. Her performance in this movie is something that has to be seen to be believed. And Dwight Henry, though not having the amount of buzz that Wallis has, really deserves a nod for Supporting Actor. What makes the performances, as well as all the other aspects of the movie work, is that there is no tricks, no cheating, 0% BS! Most directors, even great ones, have to lie to their audience. But Benh Zeitlin brings far more truth than lies into the world depicted in the film. There ARE kids that go through hard times like this, and this is an incredible look on what life is like in the poorer part of the United States. Whoa, that was a mouthful. In conclusion, this a must-see for ANYBODY. Yeah, there are some swearing, but if your kid can handle that, they shouldn’t have to pass this masterpiece by. And neither should you. I agree! I didn’t really know what to expect of this film though I had heard that it was excellent. I was blown away by the acting, directing, story, and imagery in this beautiful film. Terrific review ConMan!